The Composition Program continues its commitment to helping students consider how the language they use affects the people around them. In their first-year writing courses, students study how writing enables them to explore complex ideas, perspectives, and experiences. Writing classes help students develop the kind of intellectual engagement and critical thinking that will support them in all of their classes. In fall 2018, the Composition Program will publish its twelfth edition of Fresh Voices: Composition at Cal Poly, a collection of student writing that showcases the abilities of Cal Poly’s student writers. The collection has become a staple text in our first-year writing classes. This year’s editorial committee was co-chaired by Brenda Helmbrecht, Jason Peters, and Dawn Janke. Additional composition faculty worked to select the essays: Morgan Livingston, Scott Ferree, Marin Smith, Jenny Bates, Christopher Hayter, and Sarah Grieve. If you would like to purchase a copy, please contact the University Bookstore or Brenda Helmbrecht (bhelmbre@calpoly.edu). 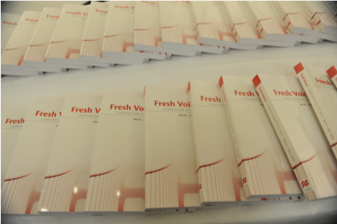 In September 2017, the composition program held its fourth “Fresh Voices Award Reception” to honor students whose essays were selected for publication. The reception is held in the University Art Gallery. 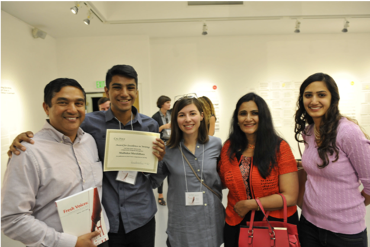 Students — many of whom attend with friends and family—were awarded a certificate of achievement and a copy of Fresh Voices by the writing instructor who worked with them. The celebration is truly a wonderful way to kick off the new academic year. To learn more about the Composition Program, please visit the program's webpage. This past year was all about experimentation and new coursework in the Technical and Professional Communication Program. Students in the new Introduction to Technical and Professional Communication course stretched their writing abilities by creating digital media projects including podcasts, e-booklets, and YouTube videos. Those who were further along in the certificate program participated in the upper-division Advanced Topics course for Technical and Professional Communication. The topic for this year's course was "Techno-Literacies," and students spent the quarter examining how language practices enable us to learn about and use new technologies. As a practical counterpart to the theoretical coursework, students selected a technical skill to learn during the quarter and created instructional materials based on their experiences. The technical projects chosen reflect the breadth of student interests and include building websites, learning Adobe Creative Suite software, programming in Python, creating digital games in Twine, and using statistical modeling software to analyze literature. As always, we're extremely proud of our students in the Technical and Professional Communication Program. This year, 11 students graduated with the certificate. Congratulations to Bridget Butler-Sullivan, Talia Bravo, Rachel Carlson, Han Naree Choi, Megan Clark, Rebecca Gates, Danielle Huliganga, Nicholas Mazegue, Riley Smith, Clarisse Wangeline and Edward Yi! 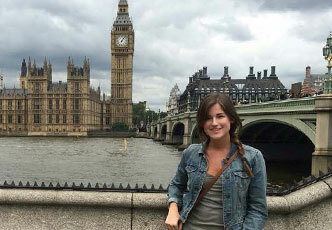 Students completing the Teachers of English to Speakers of Other Languages (TESOL) Certificate Program and the Linguistics Minor continue to pursue opportunities in teaching and graduate school. Recent alumni teach English language learners in the US and abroad in countries including Indonesia, Japan, Tanzania, France and Spain. Other alumni are enrolled in graduate programs at Boston University, University of Virginia, Carnegie Mellon University, University of South Carolina, Oklahoma State University, University of Colorado at Boulder, and Cal Poly. 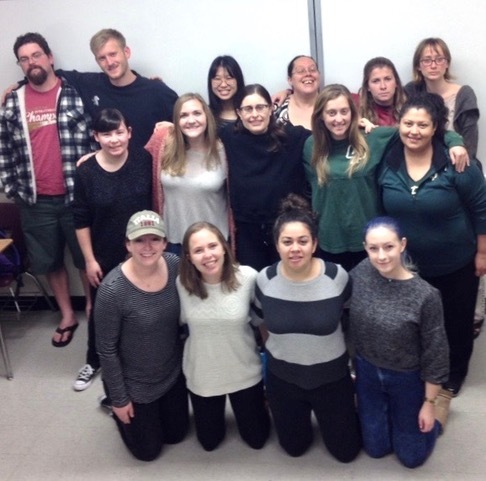 During the past academic year, the Cal Poly English Department helped host a range of WriterSpeak and CLA Speaks poets, writers and storytellers who gave presentations to students and the community. We began the year with a CLA Speaks presentation by National Book Award and Pulitzer Prize Winning Poet Robert Hass. 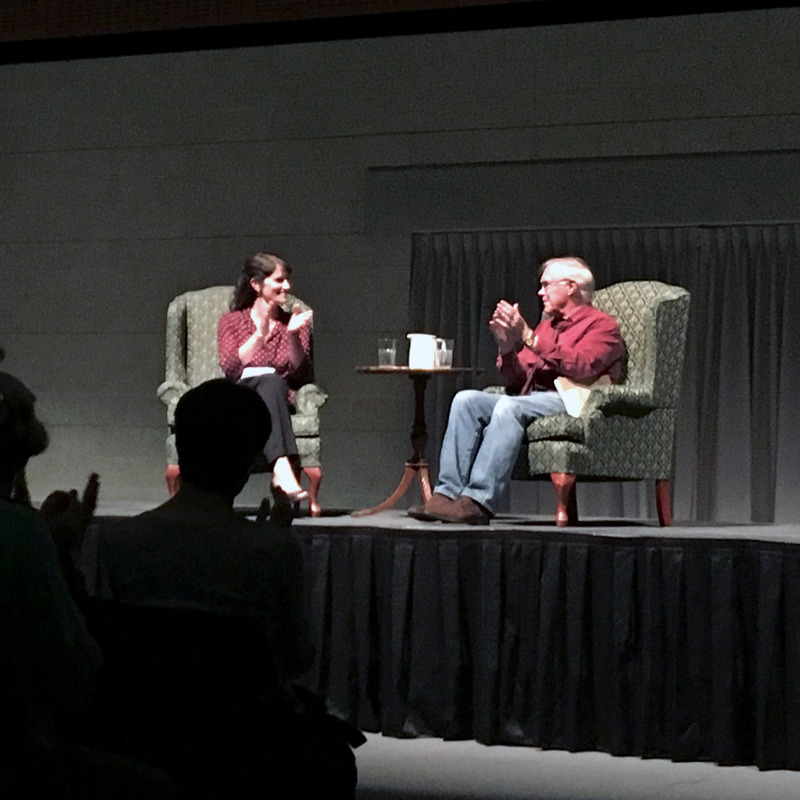 In the Multi-Activity Center, before an audience of hundreds, Hass read from his recent work and then engaged in a discussion on the state and nature of contemporary poet with English Professor Mira Rosenthal. 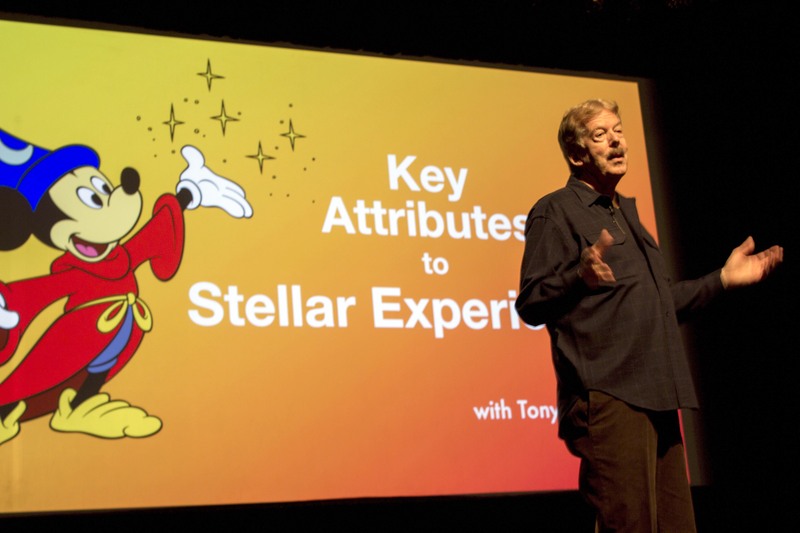 In winter, we widened the traditional definition of “storyteller” to consider how geographic space and technology are used to convey narratives, as Walt Disney Imagineering Vice President Tony Baxter discussed the concepts of successful story communication as it was practiced in areas of outdoor recreation and amusements. In spring, we closed out the year with two significant readings. In April, poet Fred Marchant, author of five collections, visited campus to deliver poems melodically focused on war, personal experience, and the difficulties of modern culture. In May, Pulitzer prize-winning novelist Robert Olen Butler took over the Business Auditorium to read two short stories and discuss his theories of narrative structures as they relate to fiction, the dramatic monologue, and the evocation of an authentic first-person voice. Over summer, professors Todd Pierce and Mira Rosenthal will begin to build out the Cal Poly reading series for the upcoming year, with an eye toward bringing in another round of writers and storytellers of national reputation, similar to those who graced campus this past year.